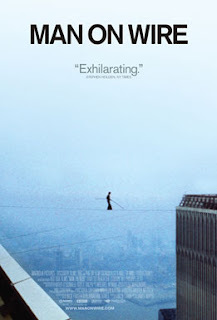 Man On Wire is an auspicious documentary that follows a french man's dream of walking on a high wire between the World Trade Center in the 70's. It was quite an astonishing feat when it occured, making headlines worldwide. You need only Google the name Philippe Petit to find endless articles on all his high wire acts. The main story told is the WTC act, but stories of his other feats are also intertwined so that we get a sense of who he is and what other things he has accomplished. We discover that Philippe is a passionate man, one filled with hopes and dreams, and it was his dream as a young child to one day cross these immense towers... towers that at the time were not even constructed yet. The story is similar to something right out of a heist movie a la Ocean's 11 or The Bank Job, with a clearly defined goal outlined in the beginning and then quickly assembling a team of experts for each task that needs to be completed. As Philippe recounts the story, we are filled with suspense as more details, difficulties and challenges are revealed. It's sort of like watching a prequel or some movie where you know what's going to happen in the end, but it's so gripping that you're never sure and you want to see how the hero gets to the finish line. Director James Marsh fills the movie with re-enactments of some of the difficulties that Philippe and his team went through. This was an interesting approach to telling the story, and if anything, helped put the audience in the situation and flesh out the intensity that the team went through. After watching the movie you couldn't help but feel inspired having watched a man gracefully live out his childhood dream. The ending is even more charming as he tells us what happened after he was arrested. Philippe encourages people to never stop chasing those dreams. The movie is available on DVD and I urge you to check it out if you want to see a heartwarming true story. Check out the trailer found here. Later geeks. P.S I just read this through again, and laughed to myself again, with the first sentence. The word "auspicious" makes me laugh every time now. You'll have to ask Keith why.